From the Pittsburgh Post-Gazette. "Breaking Bad's" new season returns to AMC March 21. Seventeen-year-old RJ Mitte (pictured) was at the right place at the right time four years ago when he was cast as the son of high school chemistry-teacher-turned-meth-lab operator Walter White in the AMC drama "Breaking Bad," which begins its third season Sunday. Set in New Mexico, the edgy "Breaking Bad" portrays the moral and emotional milieu of a man with terminal cancer (played by Emmy winner Bryan Cranston) who takes on a bizarre double life to ensure the financial security of his wife and son after his death. 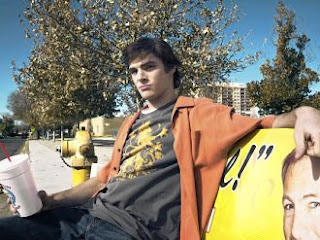 The character of his son, Walter Jr., as conceived by series creator Vince Gilligan, is a teen with mild cerebral palsy. RJ Mitte has mild cerebral palsy, too, and, he happened to be enrolled in acting school when the casting call came. Just a few months earlier, RJ -- full name, Roy Frank Mitte III -- had moved to Los Angeles with his family from Lafayette, La., because his sister, Lacianne Carriere, an animated child with bright red hair, had won a role in a video project. The idea of playing a central role in a television series -- least of all, one so provocative -- was not even remotely on R.J.'s mind when he arrived in Los Angeles without previous acting experience, he said during a recent phone interview. He enrolled in the acting studio run by Addison Witt, his sister's manager and teacher, primarily to meet kids his own age. But after doing a few background roles, including one on the Disney Channel's "Hannah Montana," R.J.'s interest in performing took a decided uptick. When the role of Walt Jr. came up, he was ready. "For many actors, the perfect role comes along. Mine came along quickly," R.J. said. Aside from having cerebral palsy, the character of Walt Jr. is more or less a typical teenage boy, complete with a smart mouth and a propensity for taking risks. "It was a phenomenal script," R.J. recalled of his initial reaction to the show. "My character has a disability, but that's not his crutch. He has a life like everyone else, and he's just trying to get through it." Mr. Gilligan wrote cerebral palsy into the role to honor a friend with the condition who had died, R.J. said. While winning the role may have been serendipitous for R.J., what he is making out of the opportunity is quite deliberate. It has allowed him to discover himself -- not only as an actor but also as an activist for the rights of people with disabilities in the entertainment industry. He has become a spokesman for I AM PWD (Inclusion in the Arts and Media of Performers With Disabilities), an advocacy campaign sponsored by three entertainment industry unions -- Screen Actors Guild, American Federation of Television and Radio Artists and Actors' Equity Association. The campaign highlights long-simmering issues regarding people with disabilities in the entertainment industry -- access, inclusion and accuracy of portrayal. "About 20 percent of people have disabilities, but only about 1 percent of speaking parts in television portray disability," said R.J., who participated in a recent summit that informed Hollywood directors, producers, writers and casting professionals about the barriers faced by performers with disabilities. One of the concerns of the I AM PWD campaign is that roles that specify a disability are often cast with actors who do not have disabilities. Alternately, if a role is unspecific to a disability, performers with disabilities are rarely asked to audition. The accessibility of auditions is also an issue. Historically, little attention has been paid to physical access and other accommodations at audition sites. Of those that do exist, far too many roles in television and film are conceived in stereotypical and even damaging ways, R.J. said. "When a person with disability is featured, it's usually a stereotype -- the angry person, the victim or the helpless person who becomes a hero," he said. An actor with a disability brings something deeper to a character who has a disability, he said. For example, R.J. plays a character who has a more pronounced case of cerebral palsy than his own. Cerebral palsy results from neurological damage that occurs before, during or immediately after birth. His character uses crutches and his speech is more affected. "To do the role, I had to really regress," R.J. explained. " I had to try to remember everything I had to do to overcome my disability." He said he also drew upon the experiences of other young people with cerebral palsy that he had gotten to know at the Shriners Hospital in Shreveport, La., when he was younger. "I remembered what they had to go through in everyday life, what I had to go through." R.J. also wants the opportunity to audition for characters that are not disabled. "People with disabilities do not have to only play roles involving people with disabilities," said Mr. Witt, R.J.'s manager and teacher. "They can play many roles. This speaks to the equality of all people to have opportunities." R.J. said he hopes that his role has brought attention to teens with cerebral palsy or any type of disability. His fan mail attests that it has. He also is receiving movie scripts to read, as is his 6-year-old sister Lacianne. "If you ever see her, you can understand why we came out here for her," R.J. said in an interview on the AMC website. In the upcoming season of "Breaking Bad," Walt Jr.'s relationship with his parents remains strained, R.J. said. "The relationship gets better, but it's still a rough area." His character continues to mature, he added. "Season three has a big eye opener that will show how much he has grown up." Disabled actor to guest star on "Glee"